Final casting has today been announced for The Rat Pack – Live From Las Vegas, which returns to the Theatre Royal, Haymarket – home to its first West End run in 2003 – for a strictly limited season from Wednesday 13 December – Saturday 3 February. The cast features Garrett Phillips as Frank Sinatra, Nigel Casey (Dean Martin), David Hayes (Sammy Davis Jr), with Joanna Walters, Amelia Adams-Pearce, Rebecca Parker and Laura Darton as The Burrelli Sisters. The Musical Director of the 12-piece Rat Pack Big Band will be Matthew Freeman. Nicola Emmanuelle will also join the show from Tuesday January 9 to celebrate the 100th anniversay of the birth of the First Lady of Song and Queen of Jazz, Ella Fitzgerald. Songs featured in this special edition of the production will include Night And Day, The Lady Is A Tramp, Mack the Knife and S’Wonderful. And from 13 December to 6 January, The Rat Pack – Live From Las Vegas – devised, directed and choreographed by Mitch Sebastian – will have a Christmas theme, with the Pack’s unique take on such festive classics as Baby It’s Cold Outside, Have Yourself A Merry Little Christmas, White Christmas, Winter Wonderland, Jingle Bells and Let It Snow, Let It Snow, Let It Snow. West End theatregoers, get set to return to the coolest party in town; Frank, Sammy and Dean are once again going to be transporting you to the world-renowned Copa Room at the famous Sands Hotel, supported by the fabulous Burrelli Sisters and The Rat Pack Big Band, in a critically acclaimed show that clocked up over 1,000 performances in its West End premiere run. 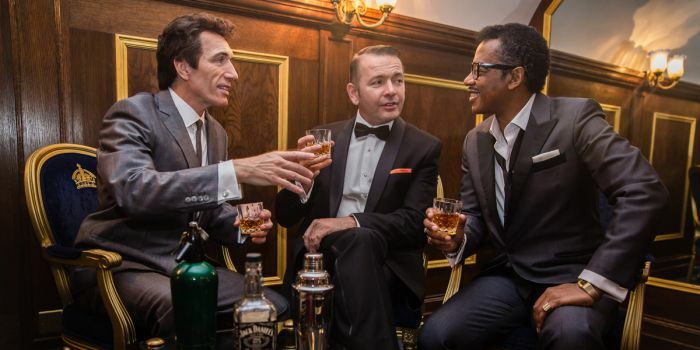 Book your The Rat Pack – Live From Las Vegas tickets today!